Disney fans won't want to let this one go. Frozen fever has been sweeping the world ever since the Disney film's release earlier this year, and now it looks like Sony is getting in on the action. At least for Japanese Disney fans, you'll be able to pick up a limited edition "Frozen"-themed PS4 from Sony's official store when it launches later this month. 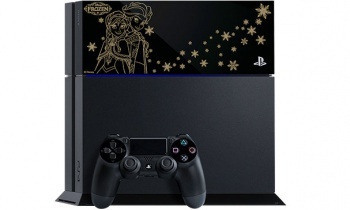 The limited edition console is based on the standard 500 GB HD version of the PS4, but adds a Frozen laser-etched hard drive bay cover featuring Elsa and Anna. It comes with all of the standard PS4 extras, and also includes a blu-ray version of Frozen for you to watch (though we'd wager anyone buying one of these consoles would already have their own copy of the movie). Sony will offer the PS4 on its official online store, where it will go on sale on July 16 for 42,980 yen (about US$425). There's no word on whether or not it will make its way to other regions at this time. While it certainly does look pretty cool, I can't help but think a blue and white color scheme would have been more appropriate than black and gold. Frozen has topped the Japanese box office for 16 weeks in a row, and its signature song Let it go, can at this point be recited from memory by any Japanese girl between the ages of six and sixteen. As someone who teaches English to said girls, I am well and truly sick of anything Frozen related. But here you go.